Throw your preconceived notions away. They’re probably wrong. I’ll just come out with it: I almost turned around. 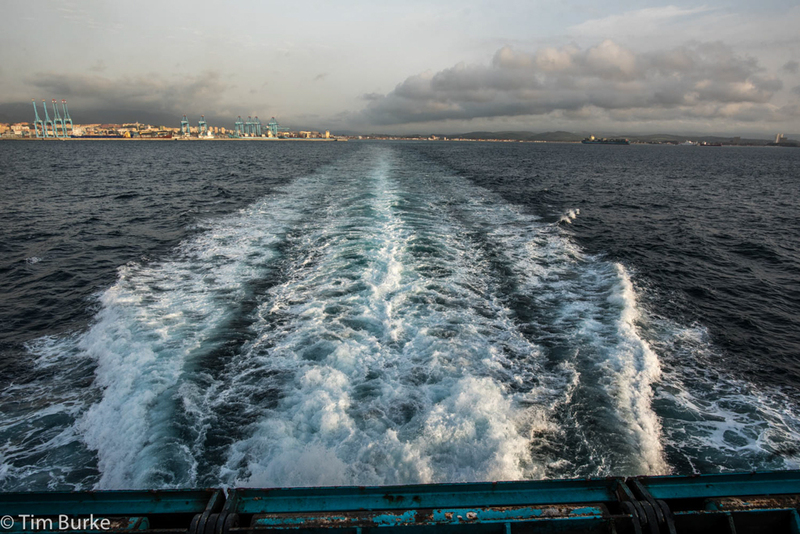 The entire ferry ride across the Straight of Gibraltar, I was questioning my direction. Am I making a dumb decision? Northern Africa is dangerous: All my friends say so. All the news outlets say so. Oh, and Facebook says so… So you know it’s true, right? 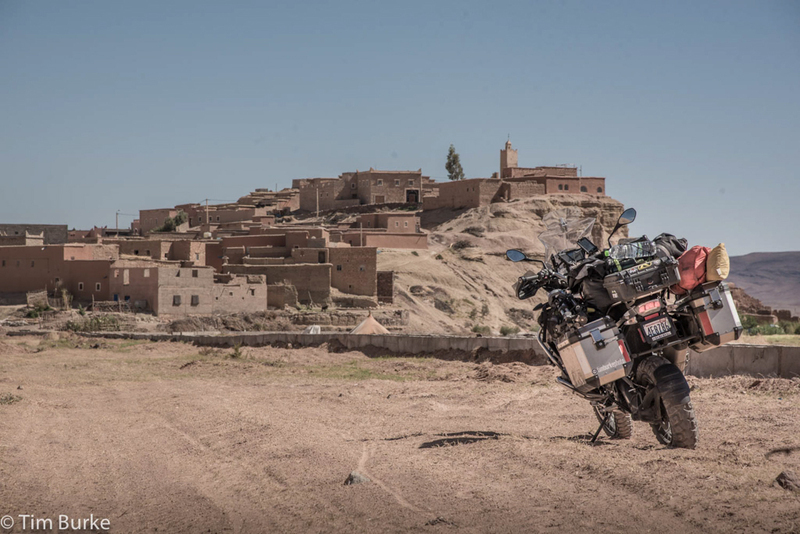 Well, at the end of my four days, I realized that by ignoring that garbage, that I had experienced the best and most eye opening motorcycle adventure of my life. And it happened in Northern Africa: In Morocco. It wasn’t any technical or brag-worthy riding. 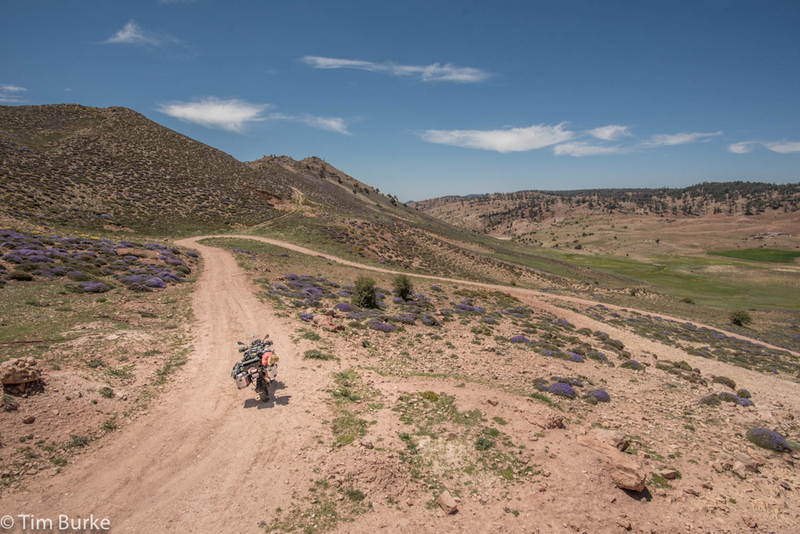 It wasn’t Africa’s stunning Atlas Mountain range or ripping along hard packed sand on Africa’s Atlantic Coast. 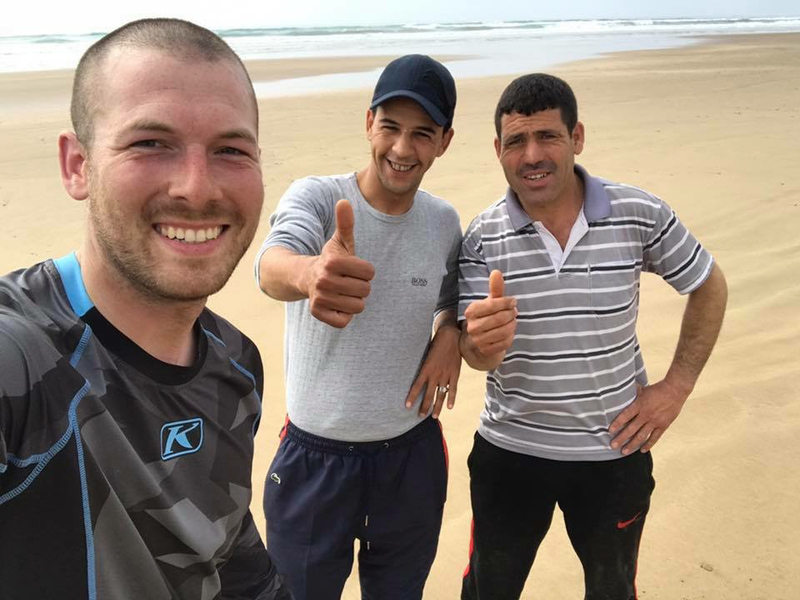 While those experiences were awesome, what changed my perception was the people who live in the beautiful country of Morocco. There are a couple different ports to sail in and out of but I sailed via Algeciras, Spain into Cueva, Spain. Cueva is a tiny peninsula, and Spanish territory, on the North Coast of Africa. The border crossing was intimidating, no doubt. Both the Spanish and the Moroccans guarded their crossing with an impressive amount of force: At least 50 guards on each side were armed with MP5s and AR15s. Cars were jam packed into just a few open lanes. Everybody but me seemed to be honking their horns, shouting, and screaming. One important note: A number of bilingual Moroccan residents are at the crossing, offering their services to be your translator through the process. At first I was skeptical of this offer, but it’s legit. Don’t be afraid to use these services as many of the guards do not speak English very well. It helped me through the process immensely. You are expected to tip them 5-10 Euro once your through – Again, totally worth it! Your title and registration is checked against your VIN number. After signing a few forms and undergoing a possible property inspection for drugs, weapons, and other contraband, you’re free and clear. The nearest major city is Tangier. Right after the border crossing, I climbed steeply into the mountain side. The waters of the Atlantic, Mediterranean, and the entire Straight of Gibraltar are visible on this windy and twisty road. 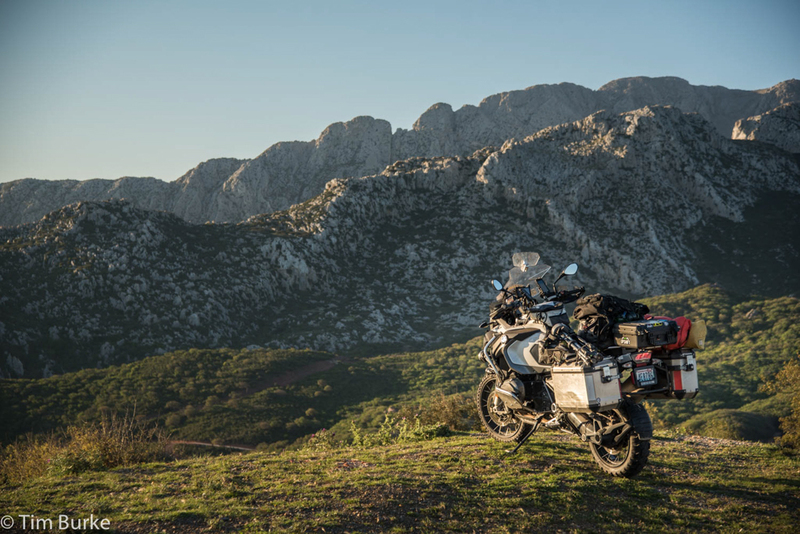 The road to Tangier is stunning. 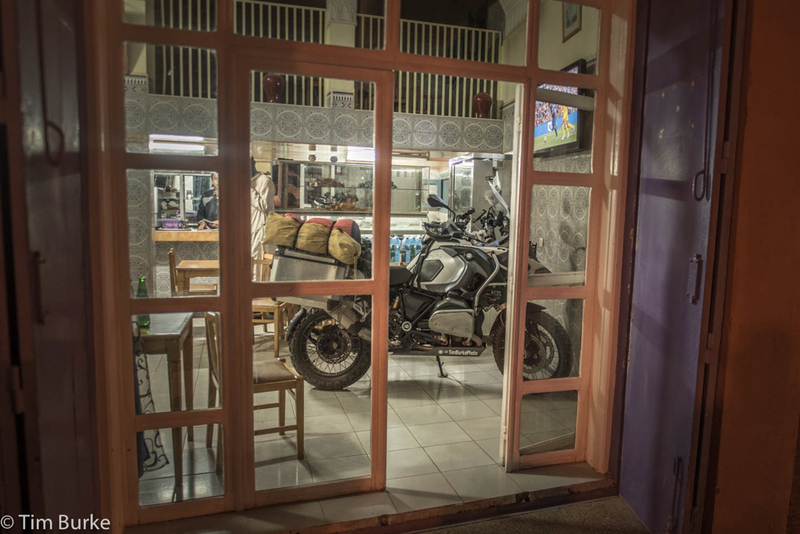 It didn’t take me long to realize the people of Morocco love motorcycles. I had people of all ages waving and checking out the bike. The “thumbs up” symbol seems to be the easiest way to give and receive compliments. 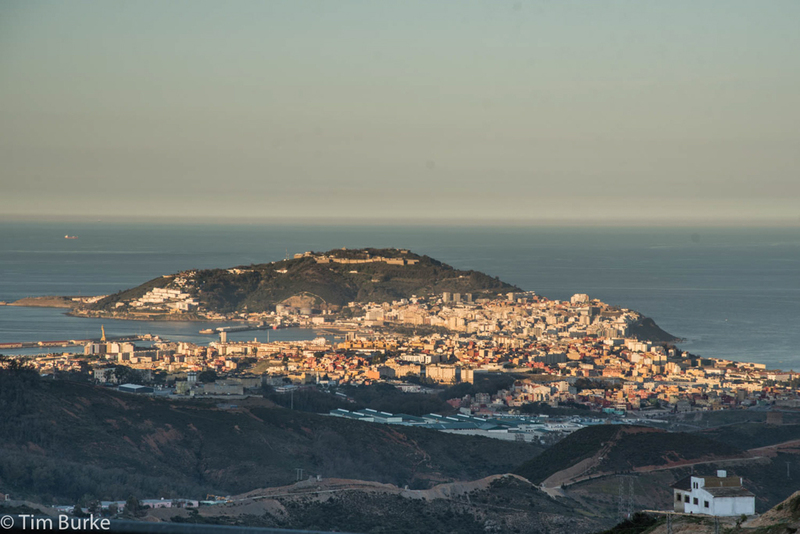 South of Tangier, the population thins out and you’ll have the opportunity to trace the coast line. There are plenty of spots to jump onto the beach and ride along the waters! 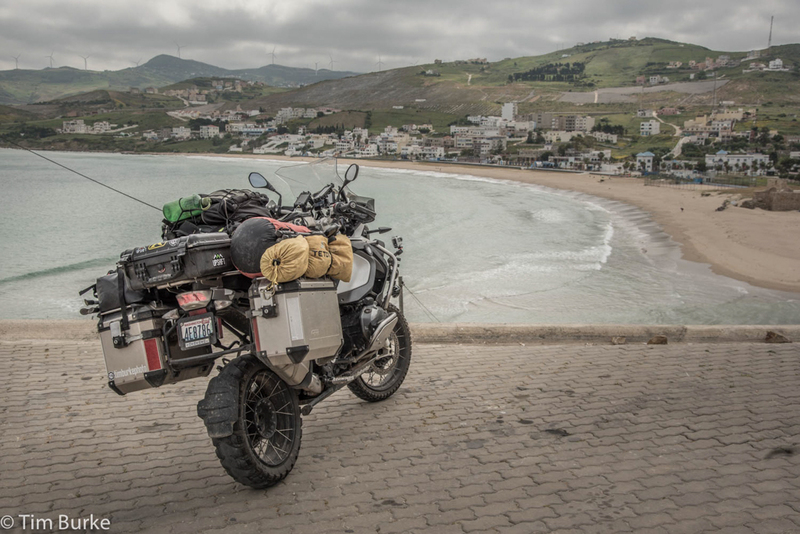 Just remember to rinse the salty sand of your scoot afterwards!By the time I got to Casablanca, I had just turned 9,000 miles on my rear tire. 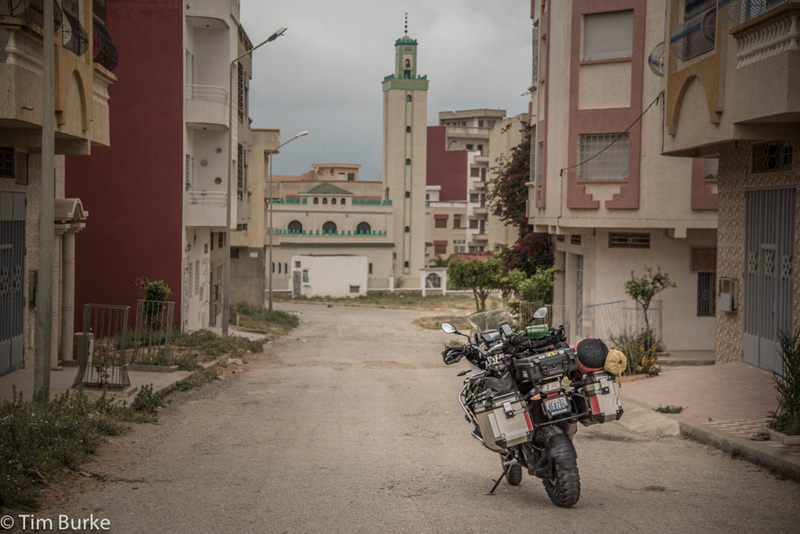 I stopped by the ADV-orientated motorcycle shop called “MotoMania.” Hint: Prices of tires, oil, and other moto-products are far cheaper in Morocco than Europe! 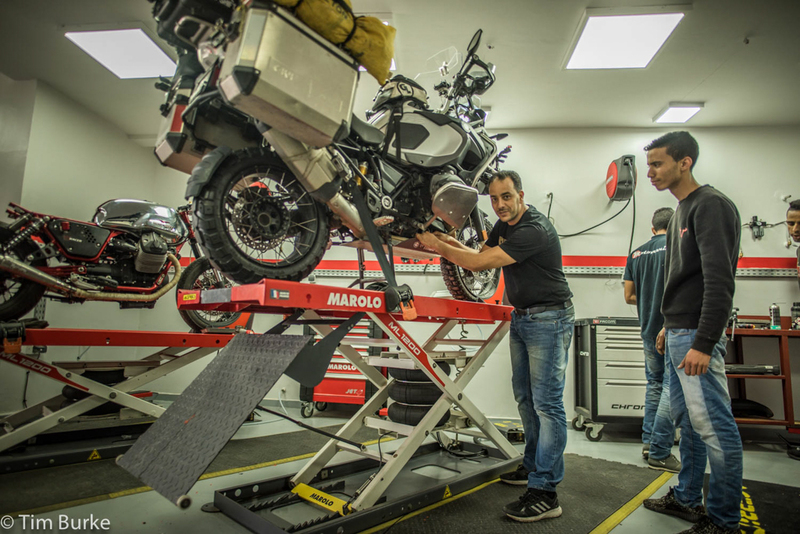 MotoMania is an authorized retailer and carries a huge line up of GIVI Products! 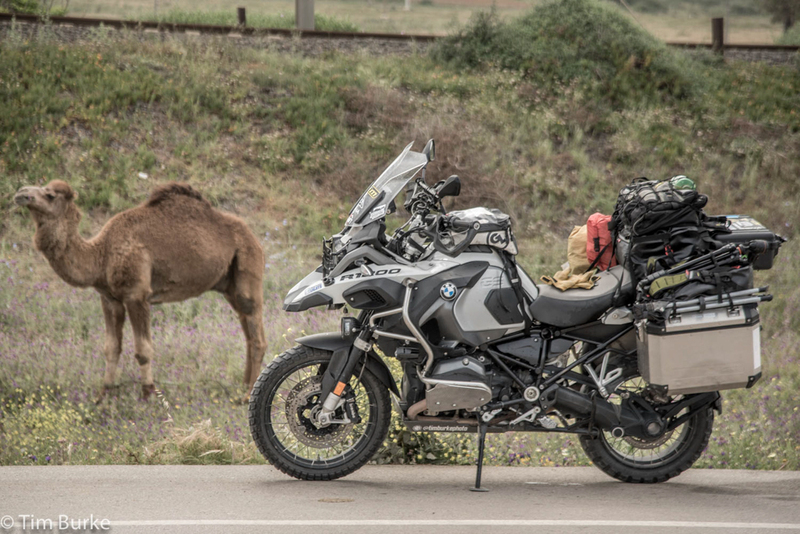 A new rear tire, 4 quarts of oil and a filter change later, I was on the road to Marrakesh. Marrakesh is an old and lively city jam-packed with amazing food! My biggest regret in Morocco is that I didn’t spend extra time in this city! I could have sat there for three days and watched the activity! 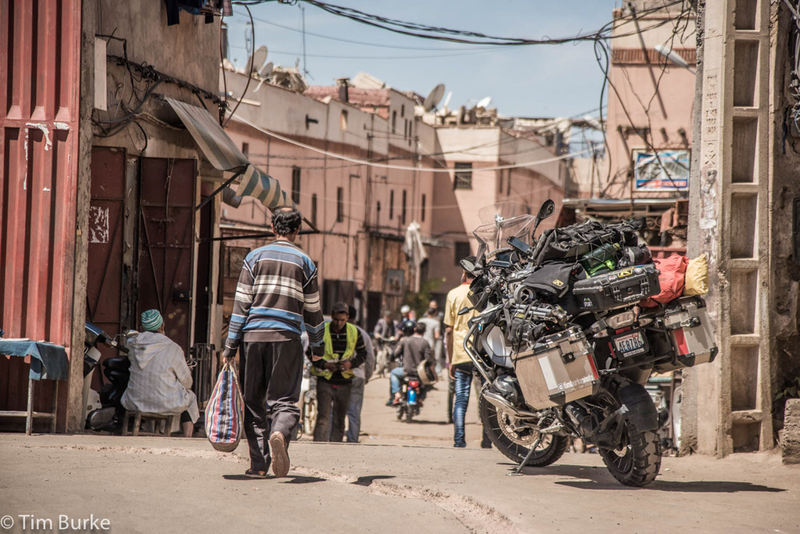 The market place is busy – But motorcycles are allowed up and down the narrow streets in this area! 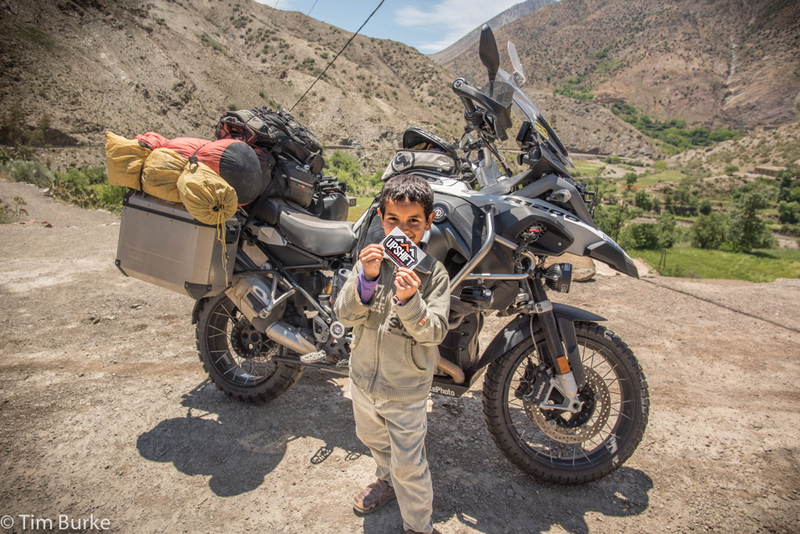 I had ground to cover though and I was bound for the epic Atlas Mountains! And by epic, I mean breath taking. 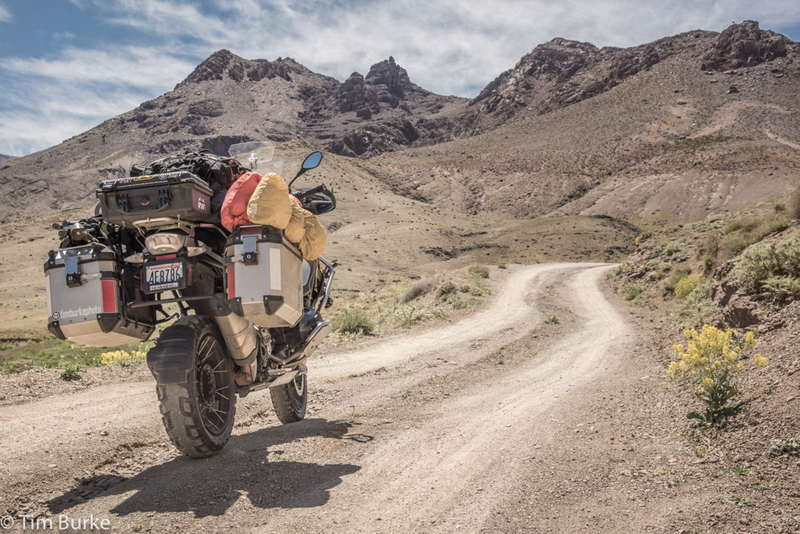 The mountains offer more dirt roads, both double and single track, than can explored in just one lifetime. Do not rush through the Atlas range! Once on the other side, things heat up a bit: Literally! 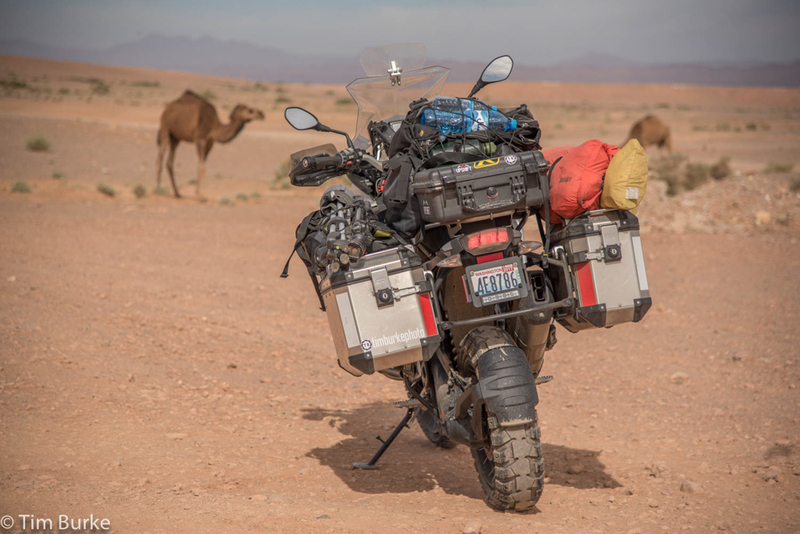 Temperatures quickly rose to above 100 degrees F as I descended out of the mountains and into the Sahara desert. The animals have it figured out though! Remember to bring lots of water. It should be noted that the tap water in Morocco is generally not considered healthy to drink. I bought water by the 1.5 liter bottle every chance I could. I kept my hydration pack full and an extra bottle on hand when in the desert. By the time I got to Tinghir, it was time to start making the trek north, back towards Europe. 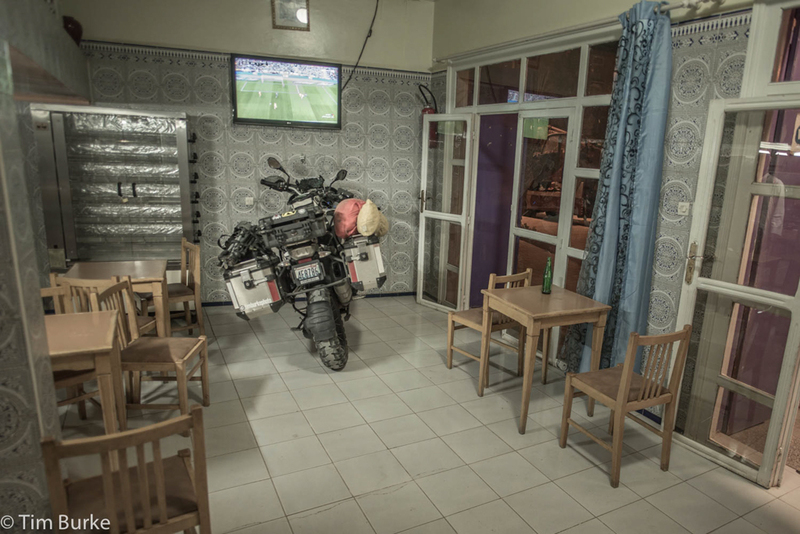 I spent the night at “Hotel Cafe Restaurant ETOILE DU SUD.” In Tinghir. While I felt safe and secure during my entire stay in Morocco, I’ll never turn down the opportunity for “extra secure” parking! 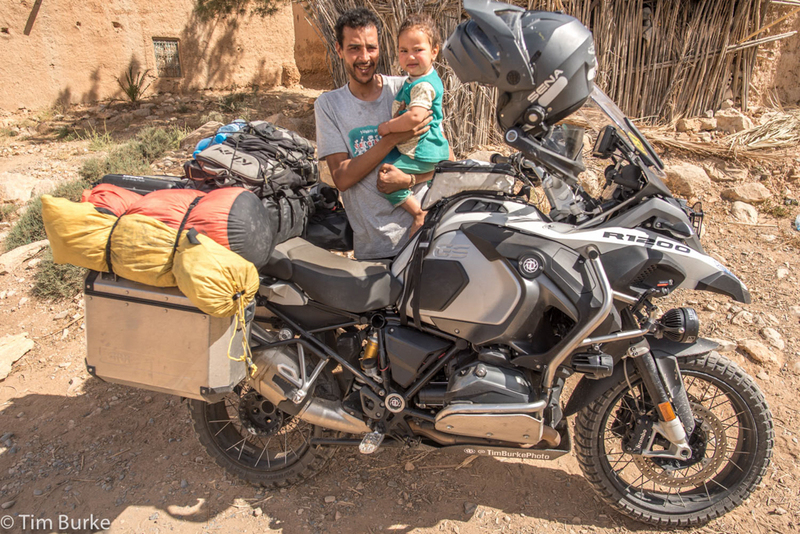 It was on my way back that I got to experience what family life looked like in Morocco. 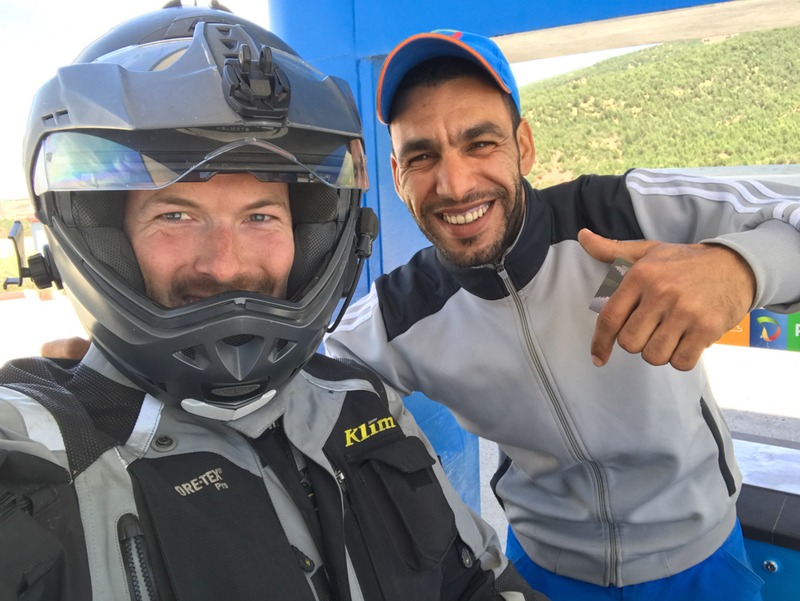 I was crossing the Atlas Mountains again (east bound this time) and stopped to refill my hydration pack in a small mountain village. A man and his daughter came to see where this strange motorcycle had come from. I was invited inside his home for mint-tea, a delicious staple in Morocco! Of course, after tea, they wanted their picture taken! It’s experiences like this that I’ll never forget. 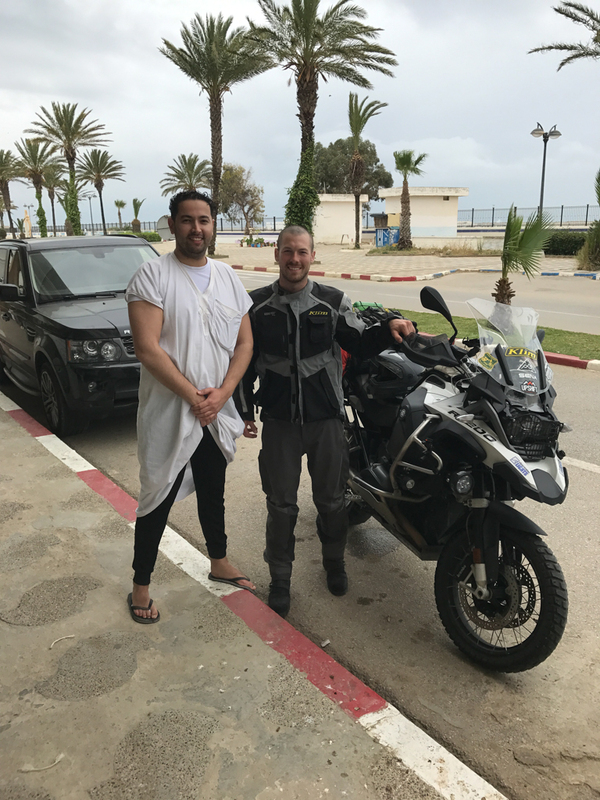 In four days, I covered almost 1,300 miles through Morocco. They people were kind, honest, and hospitable. I’m so glad I took the opportunity to go to this special place. By the time I got to the ferry terminal in Cueva, it was 11pm. My ferry didn’t get me into the Gibraltar area until almost 12:30! All I wanted was a bed. I slept that night knowing I had made the right choice. Morocco, I’ll be back. I’ll be back real soon!